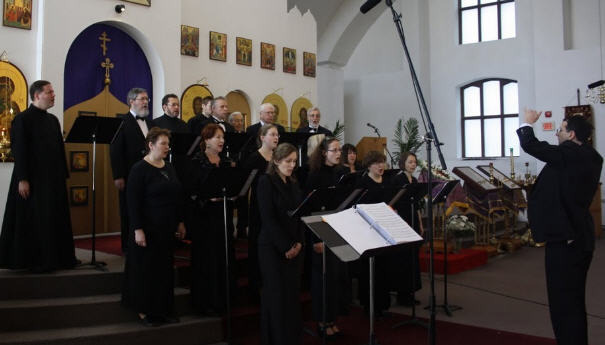 Welcome to the home page of the St.Nicholas Russian Orthodox Cathedral choir. The purpose of this page is to provide information to all those interested in Russian Orthodox sacred music. Members of the Cathedral choir can visit this page for announcements and for downloading music material. Our parish is in constant need for singers and readers. The parish has a busy schedule of services throughout the Liturgical year. We celebrate vigil and Liturgy on all Saturday evenings, Sunday mornings and Great Feasts,respectively. As well, Great Lent preceding Pascha is especially busy. You can view the service schedule on the parish web site at www.saintnicholasmontreal.com. A word about choir duty. A choir is always needed for the celebration of services. The choir is in constant need of new singers to replenish and grow the ranks of the choir to a respectable size. Services are celebrated in church slavonic, sung in traditional (obikhod) chants, as well as old chants and compositions. Singers need not be professional, nor know any of these elements of church singing. As long as they have a good ear, they will easily and quickly learn. Choir duty also includes giving exposure to the rich culture of Russian Orthodox sacred music. As such, the choir presents concerts to the public. These events also serve as fundraisers for the parish and for charitable causes. In 2011, the choir gave a benefit concert for the suffering in Japan following the devastating earthquake and tsunami. Those with a talent to sing should make it a duty to join the choir ranks. Singers in our parish are not trained musicians, and they are not paid. But they have a gift from God, and they give of their time and talent for His glorification. Singing in a choir is a duty and obligation. It requires a commitment. It requires dedication to be present regularly at services, and to attend rehearsals. If you want to join the choir or if you want more information, please contact any of the clergy, or contact the choir director Michael W. Krieger (regent@stnicholasmontreal.com). A commemorative video has been produced and can viewed by clicking on the link below.